We did it! Well almost anyway… The first week back at work after the Christmas holidays is almost over and thankfully it was a short one! While it is nice to get back to a more normal routine I am missing the long catch ups with family and friends, lazy breakfasts and late nights watching tv or going to the pub after a rich dinner with plenty of wine. Unfortunately we cannot live like this all the time… if only! 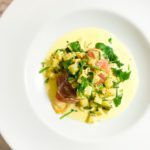 But we shouldn’t get so down about January even if it does feel impossible not to be hit with those post-Christmas blues and exactly why I am cooking up one of my favourite dishes this weekend – Mussels in a White Wine Sauce with Garlic Ciabatta. My husband and I ended up with a busy Christmas holiday and lots of traveling that I cannot wait for this weekend where we will be relaxing in front of the tv and enjoying a nice dinner. January should not all be about some kind of punishment diet for enjoying ourselves over the festive period and especially with the weather being so cold and dark! I have previously mentioned my love for the life of hygge, where the people of Denmark embrace the winter months with long dinners by candlelight, a nice bottle of wine, a good long and fresh walk on a Sunday afternoon and a lazy afternoon with a cup of tea, slice of cake and a good book. This is what January should be about and I can’t think of a better way than to kick start the first proper weekend with a big bowl of Mussels in a White Wine Sauce with Garlic Ciabatta. 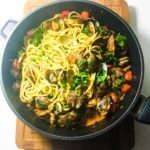 Mussels are at their best during the autumn and winter months and is one of the reasons why they are pretty much near impossible to find in Berlin outside of mussel season. I pick mine up from a local nearby supermarket and I soon figured out that Thursday afternoons are when they stock up, so I quickly snap them up that evening as they will be sold out by Friday. 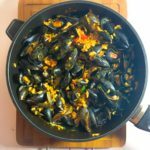 My favourite way is to cook mussels in a creamy white wine sauce with shallots and fresh parsley and coriander but I also love making Coriander and Harissa Mussels for a bit of extra spice! I serve the mussels with what I call Cheat’s Garlic Bread. I simply gently slice and stuff a ciabatta with some butter, garlic and fresh herbs then lightly drizzle with olive oil and bake in the oven for 10 minutes. Chunks of this bread dipped into the sauce is absolutely delicious and will cheer up any dreary, cold January evening! I buy the mussels fresh in their shells and often come vacuum packed. They will keep for just a day or so before you need to cook them. Usually they will have already been washed but give them a quick wash beforehand. Discard any opened mussels before cooking and also discard any mussels that remain closed after cooking. Take the ciabatta out of any packaging and place on a roasting tray. Gently start to slice it as if you were to cut into slices but only slice halfway down to the middle. Mix the butter, 3 cloves of garlic, a pinch of the chopped parsley and coriander (the rest is for the mussels), all the rosemary and thyme and mix together until well combined. Then gently stuff the slices with the butter and garlic mixture and lighlty drizzle some olive oil over the top of the ciabatta to give it a golden, cripsy topping. Place in a heated oven at 200C/fan 180C/gas 6 for around 10 mins. Leave to cool for around 5 mins before serving. In the meantime heat a dash of olive oil in a large deep sauce pan. Add the shallots and garlic and stir until the shallots start to brown. Then add the white wine and cream and cook on a medium gentle heat for around 3 mins until the cream has warmed up and is hot. Drain the mussels (if from a vaccum pack with salted water) and then add them to the saucepan and put the lid on. Turn the heat up and once the cream sauce starts to bubble again with the mussles gently turn the heat to a medium level (this will only take 1-2 mins). Then leave the mussels to simmer in the sauce for around 8 mins. Check the mussels and if they are all fully opened then they are ready. Take the pan off the heat and stir in the fresh parsley, coriander and lemon juice. Season with a bit of salt and pepper and mix everything together in the pan. Serve the mussels in bowls with plenty of the sauce and the garlic bread on the side.